Predefined cohorts for the analysis included BRCA mutant; BRCA mutant or BRCA wildtype/high loss of heterozygosity; and the intent-to-treat population (ie, all randomized patients). PFS in each cohort was evaluated in subgroups of patients having received either 2 or ≥3 prior chemotherapy regimens. In each of the predefined cohorts, rucaparib significantly improved PFS compared with placebo, irrespective of the number of prior chemotherapy regimens. The safety profile of rucaparib was consistent between patients who received 2 or ≥3 prior chemotherapy regimens as assessed by the rate of all-grade (100% and 100%) and grade ≥3 (59% and 59%) treatment-emergent adverse events. Dose modifications (ie, treatment interruptions and/or dose reductions due to a treatment-emergent adverse event) were also similar between each subgroup (70% and 74%). 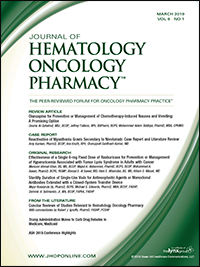 The results of this post-hoc analysis suggest that the improved PFS associated with rucaparib maintenance treatment compared with placebo is not affected by the number of prior chemotherapy regimens received in the 3 predefined cohorts that were evaluated. Coleman RL, et al. Lancet. 2017;390(10106):1949-1961. Lorusso D, et al. ESMO 2018. Abstract 947P.